Those who wish to pursue a serious interest in the arts may wish to consider setting up and running their own gallery. With the art scene opening up so much and sales of artworks always on the rise, it is easier than ever to establish and maintain an art gallery. The contemporary art world itself is one of the least marketed and regulated markets in existence and as such is more open to fresh starters than most other markets. With many new markets opening geographically now may way well be the time to establish yourself. As with so much in the art world, the best way to start is to throw yourself in at the deep end. Although there are obvious practicalities to consider, like finding a suitable building in a good location, these things will all come easily once you start looking. You will need to make sure that you have the funds to start your gallery and to maintain it as you develop a reputation. This is something that any high street bank will advise you upon. You will, if you wish to borrow money, need to develop a business plan. Many councils also offer advice for new business start ups. One of the main things that you will be expected to do at this stage is consider your initial outgoing and incoming costs. You will also need to have a good idea about the type of gallery you are opening: what is your particular slant on the art market? 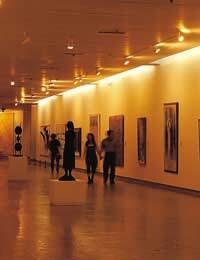 This will enable you to better target artists for exhibition. There are practicalities to consider, such as what type of business status you wish to take on, how many employees you would like to have (if any), how you will promote your space, and so on. It must be noted, that in light of these, and the innumerable other decisions that you will have to make, there are no ‘right’ ways of doing things. From shabby spaces in (barely) converted warehouses in the East End, to palatial spaces in the West, crowds are attracted and art is sold. The thing about the art market is that it is so open that ‘quality’ of work is the only essential factor – and quality is, after all, a very subjective thing. So how do you mark yourself out from the rest? Whilst a few celebrity friends and a huge bank balance would not go amiss, a genuinely good attitude and friendly approach will get you far. As the market is saturated with good saleable work it follows that, beyond quality one of the other major factors that will come in is price. However, the market is so buoyant, with the creation of many City millionaires occurring yearly and a generally strong economy that the final factor will reside in your own business acumen. In the art world this generally means being ‘nice’ and not being a hard nosed and entrepreneurial. If you’re starting small, emphasise the role of community, get local people involved, and interact with small galleries around you. If in doing this you foster a trustworthy group of friends/colleagues along the way, you will have set yourself up for a steady growth. In the art world people will always ‘pass on the message’, on the approximate understanding that you are doing the same. Establishing networks along these lines, whilst sourcing good quality works, and treating artists respectfully should ensure that you make good development, provided that you have the income in place to get off the ground initially.